Ever since The Great British Bake Off came back into our lives three (and a half) weeks ago I have been craving all the cakes, biscuits and breads you can think of! I was of course hugely inspired by cake week but I have only just got around to actually baking anything. My intention was to bake something walnut inspired due the the walnut cake technical bake so I thought I'd bake a traditional coffee and walnut cake (something that has been on my 'to-bake' list for ages). 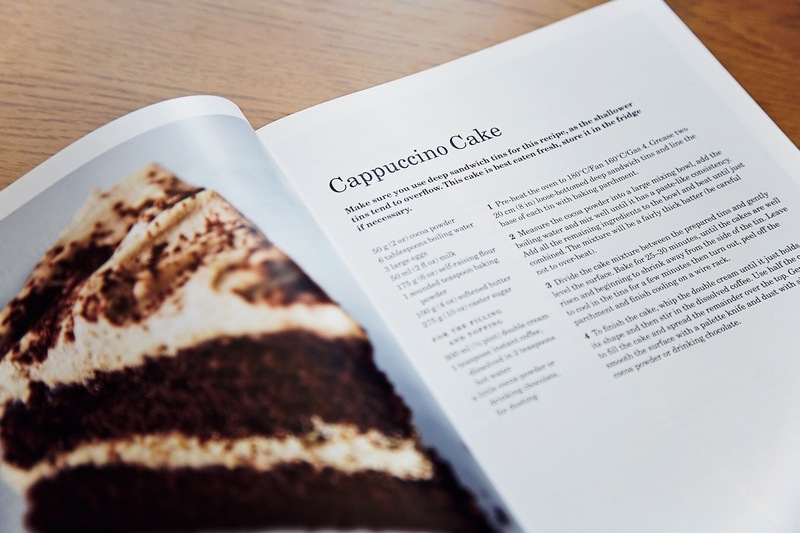 However what was once going to be a Coffee & Walnut cake swiftly became just a coffee cake until I spied this recipe in my Mary Berry's Baking Bible for Cappuccino Cake. It's really not my fault, honest! 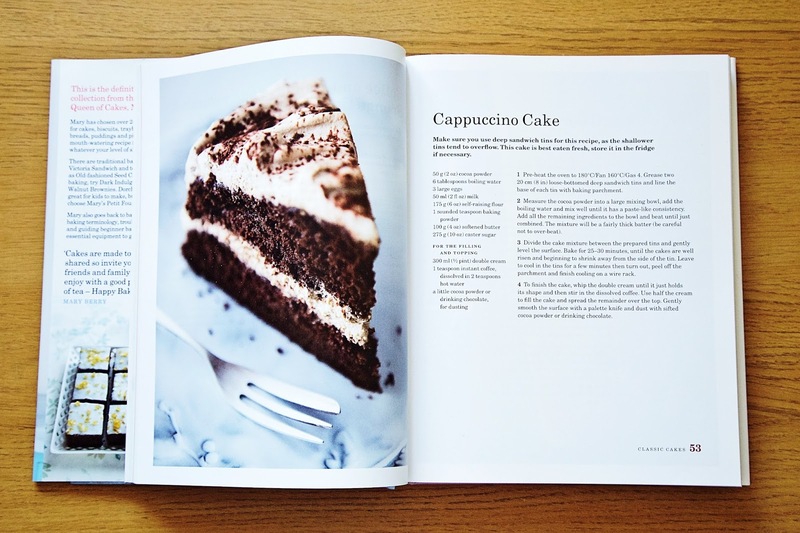 All the coffee and walnut themed recipes are next to each other in one section of the book so as I was flicking through I 'ummed' and 'ahhed' for ages about which one to make but I just couldn't resist the look of the creamy cappuccino topping and chocolatey goodness. 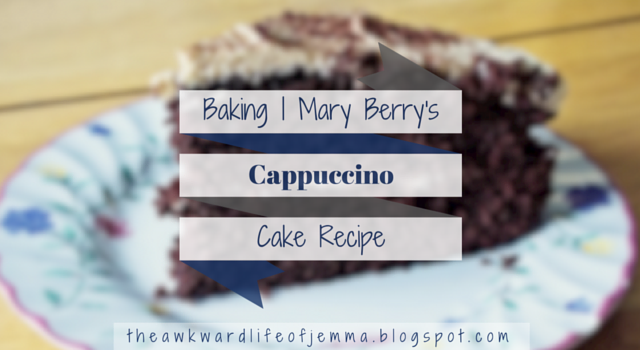 It's actually a really simple cake to make as it is essentially a regular chocolate sponge with whipped cream (yum!). 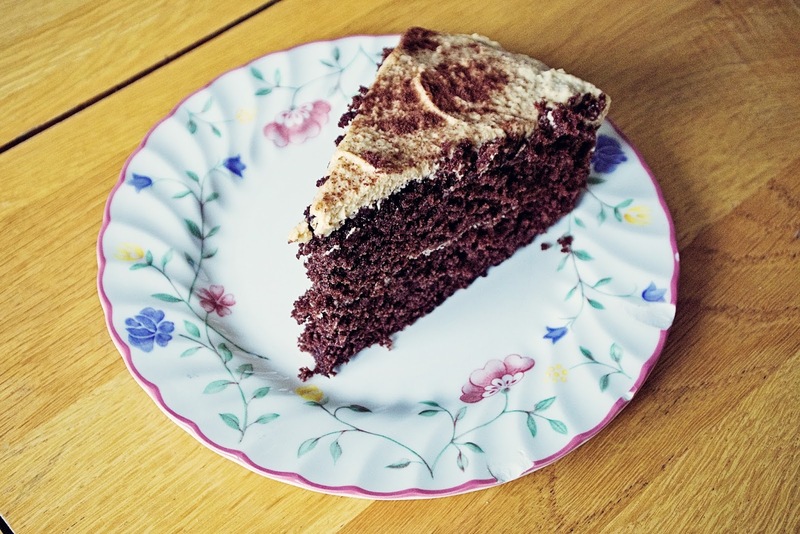 I was particularly craving chocolate indulgence last weekend as, let's face it, all healthy good intentions drift away when it's that time of the month so I decided this cake would fulfil all my cravings and then some. Harry and I were also attending a BBQ at his parents house so I knew I would be gladly welcomed if I brought this cake along, and there would be a bit less of it for me to eat if I did! I was a little concerned as Mary Berry writes that the batter should be quite thick, and I wasn't convinced that mine was, perhaps that is why my layers didn't seem as thick as hers did in the photo? I'd also run out of baking parchment so I decided to wing it and just grease my tins as much as I could! Luckily the sponges turned out alright. It was a little tricky removing them from the pans without the baking parchment for help but they came out mostly in one piece. One of the sponges was a little crumbly so I decided to use that for the inside of the cake and piece it back together with the whipped cream topping! It is the cream that gives the cake that cappuccino flavour as it is mixed with just a little bit of brewed coffee. This works really well as the coffee flavour isn't too overpowering but you can definitely notice it. After putting the cake together and smoothing the whipped cream over the top I dusted it with a little hot chocolate powder for decoration. I much prefer using hot chocolate powder over cocoa powder as the latter is so bitter! (I've made this mistake before when making chocolate truffles, ick!). Although the cake didn't turn out quite as pretty as I'd hoped it tasted amazing! 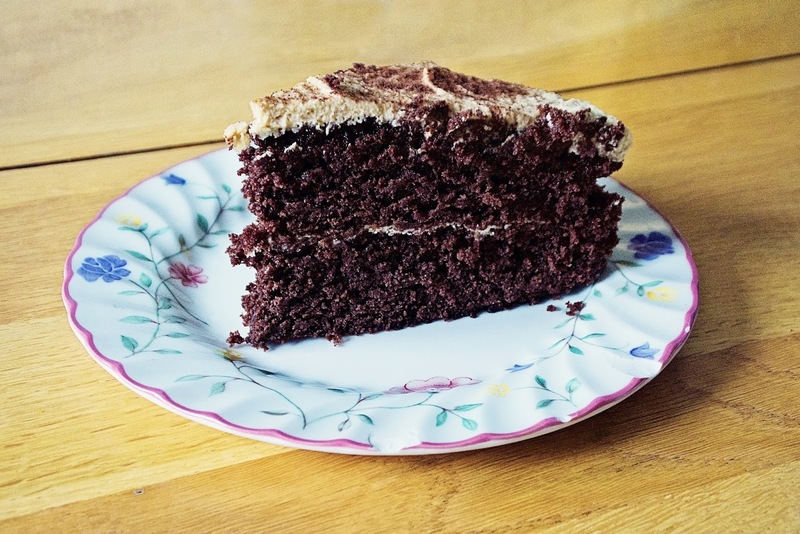 Chocolate cake can be really rich and sickly, particularly if it is sandwiched together with ganache or buttercream, but because this is topped with cream it makes it a lot lighter. The coffee cream compliments the chocolate sponge really well and the bitter coffee helps to cut through the sweetness of the sponge. I was even told that this was the most light and delicious sponge that I have ever made! But perhaps my biggest compliment came from Harry's mum who declared that she doesn't even like chocolate cake (crazy I know) but she liked this one! She even requested that I bake another one for her birthday for her to take into work and share. Overall I think the cake was delicious, moreish and exactly what I needed to satisfy my cravings so I would highly recommend it to anyone that likes chocolate and coffee, or just anyone who liked cake! It is very quick and simple to make so there is really no excuse not to make it the next time you have a free Sunday afternoon. I have a feeling though that next month's bake will be biscuits, which I am much more wary of, but whether they make it into a box made of biscuits it highly doubtful! Now I do believe it is time for a cup of tea..